Monday through Friday 9am -5pm. After hours appointments available with notice. 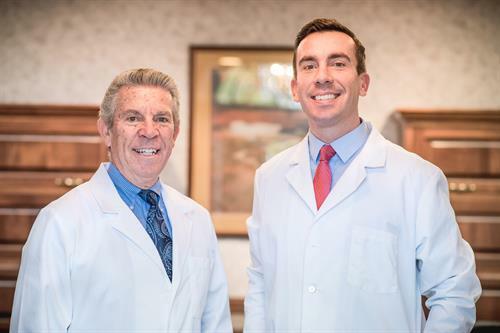 We are a father and son team that has provided hearing healthcare to the city of Springfield for over 30 years. In 2016 we began the conversation that led to us opening our own hearing care practice in the fall of 2017. We are excited to be working together to bring the absolute best hearing care to the city we love. Bill Bruns helped establish a nationwide hearing practice throughout his 30+ years working with the Springfield community. His vision has always been to give his community the best care and affordable solutions. He is committed to helping anyone who asks and will help guide them on the path to better hearing and understanding. Bill has and continues to be very active in community groups and boards that all serve the betterment of Springfield. David Bruns started his career in hearing healthcare in 2009 and has enjoyed every minute of it. Growing up with a father in the hearing field, he learned from an early age the fulfillment in giving understanding to the hearing impaired. David compliments his fathers wisdom with the knowledge of the ever changing technological breakthroughs happening in the hearing sciences and how to utilize that for the patient. We are located at the corner of Snyder Street and W North Street. We are 1 mile east of the US-68 / Route US-40 interchange. US-40 becomes W North Street as you approach Springfield from the west.